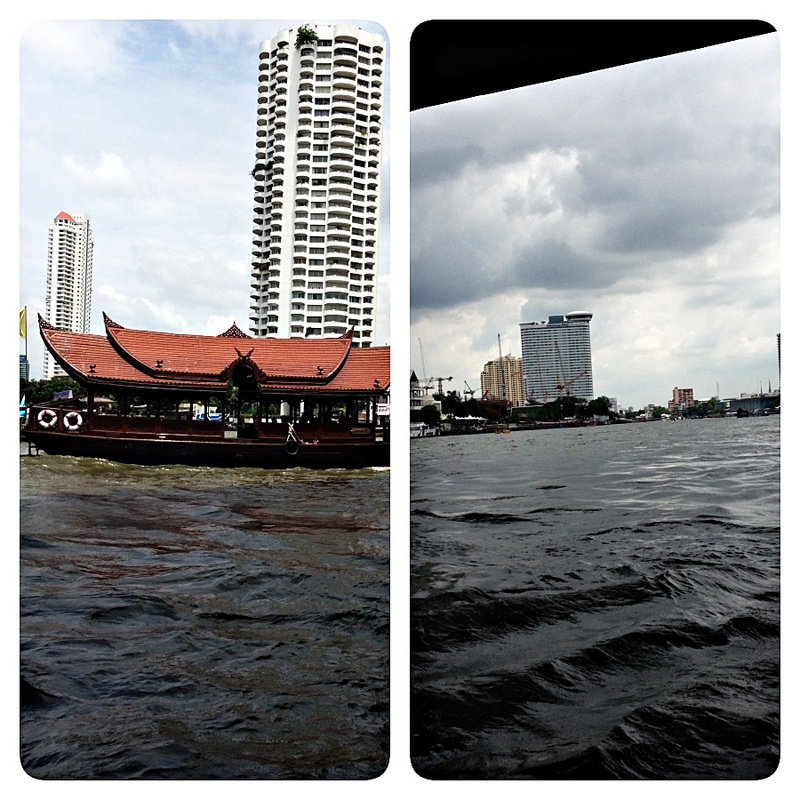 1.Boat ride on the Chao Phraya. I very much recommend this boat ride as it has multiple stops that include the Floating market,Grand Mosque,Vat Pho and Vat Arun.It’s a fairly in expensive ride and offers some great views of the city. 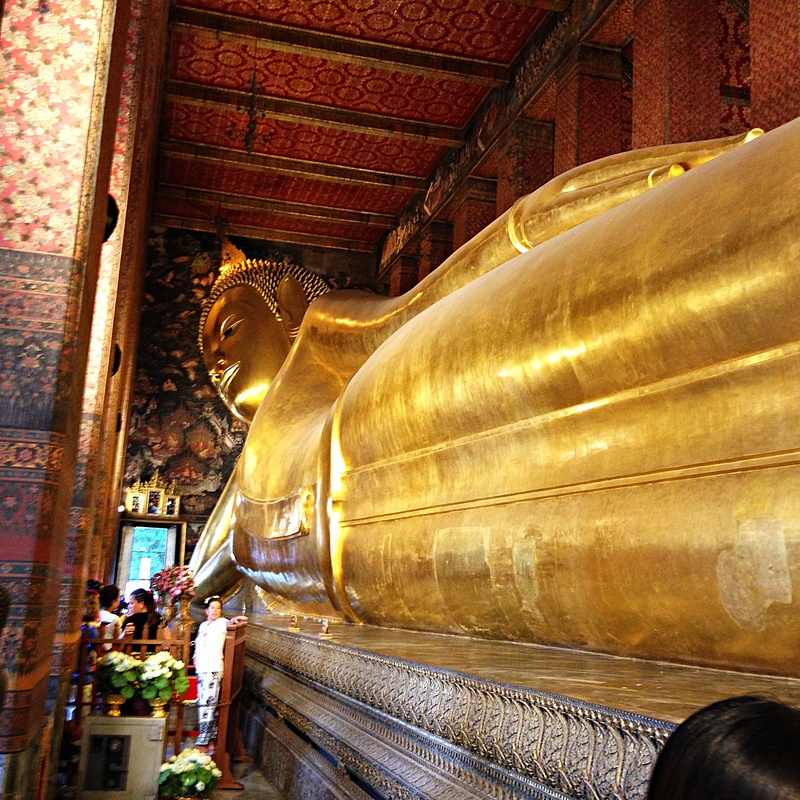 Our first stop is Wat Pho which is a large Buddhist temple complex that houses the Temple of the Reclining Buddha.This 46 meter statue of Buddha is quite spectacular indeed,the body is gold-plated and is decorated with mother-of-pearl inlay on his eyes and the soles of his feet. 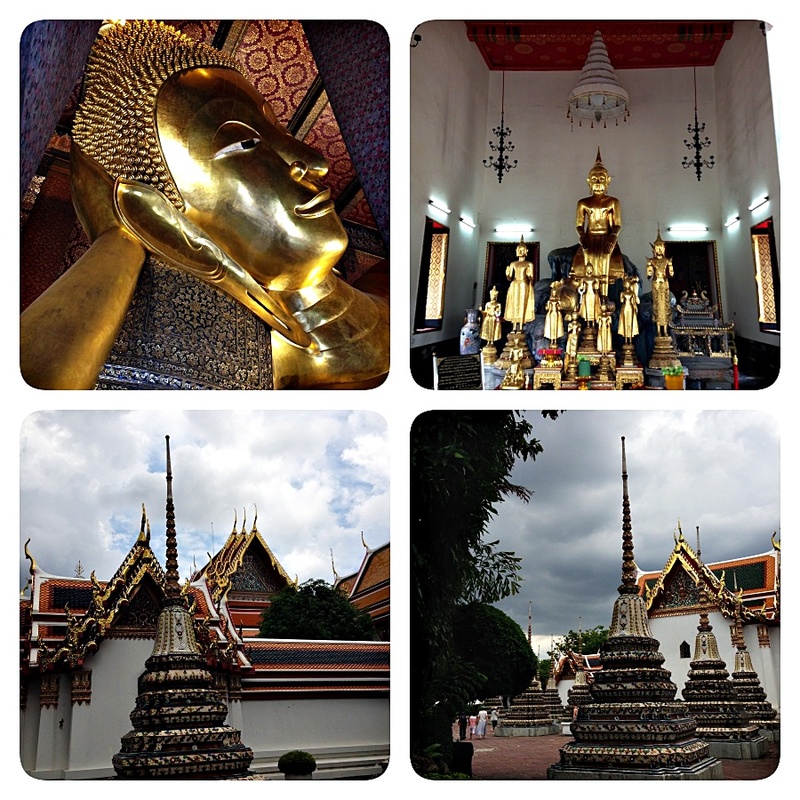 The large grounds of Wat Pho contain more than 1000 Buddha images. The grounds are split in two by Chetuphon road. The northern section is generally the only one most people go to, and it includes a large bot (temple hall), enclosed by 394 bronze Buddha images. 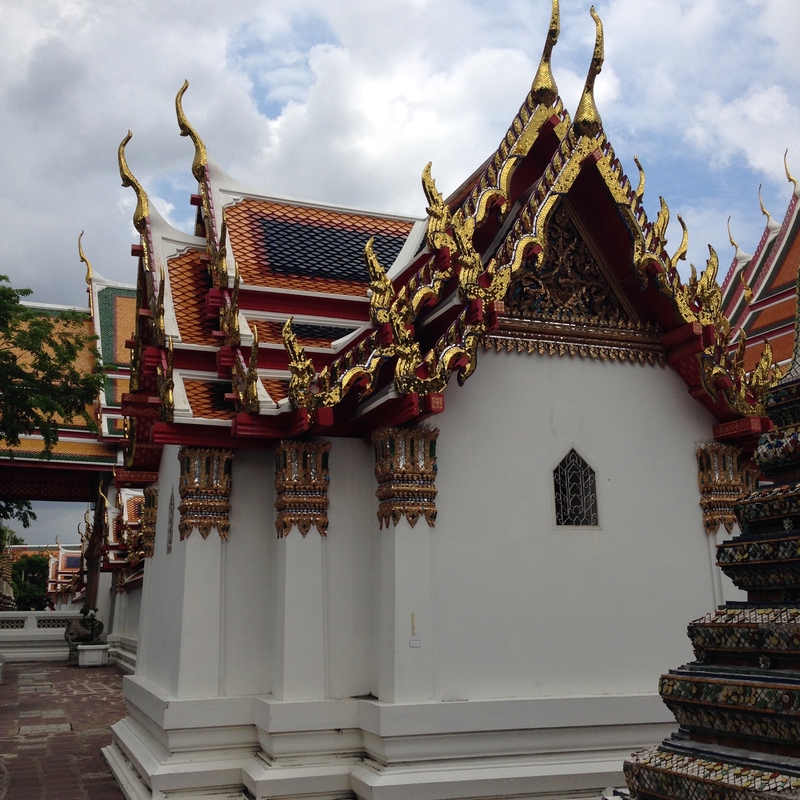 There are also a massive 91 other temples along with chapels, gardens, and various types of statues too. The library is nearby too, decorated impressively with figures and pagodas made of porcelain. A short boat ride takes us across the river to Wat Arun also know as the Temple of Dawn best know for its huge Prang or tower.We admired this architectural wonder as it’s certainly quite a beautifully made temple with fine craftsmanship and intricate work on each of the spires.We were unable to climb the spire as the temple seemed under restoration, all though it is possible to climb right to the top which offers great views of the river Chao Phraya.We decided to walk around the complex and admire the other buildings in this pavilion. While walking down the numerous streets in Bangkok,one can’t help notice the huge array of exotic fruits being sold by street vendors.They seem to don almost every corner of this city.A great way of beating the heat and staying hydrated,we shuffle between various carts and sample quite a few varieties of Mango,Durian,Pineapple,Papaya and delicious tender coconut.Most of the vendors have the fruit chopped and neatly displayed on their carts and seemed fairly hygienic too. On our way to Wat Arun we stopped by a small hole in the wall kind of place with very unpretentious interiors.It seemed to sit no more than 7-8 tables,but seemed brimming with tourists and doing brisk business.Quite hungry we decided to wait in line to be seated and were ever so happy that we did.This small family run place seemed to serve up some great Thai delicacies that kindled our taste buds with fiery spice and intoxicating aromas.We decided to share a Pad Thai (spicy rice noodles with bean sprouts and peanuts), a Chicken green Curry with rice and some vegetable spring rolls with a honey dipping sauce and a chilled tender coconut to cool us off. Rising some notches above street food and casual eateries,we discover Nara at the Erawan complex,noted for a fine and sublime Thai experience.This place is busy as we arrive around 8pm on a friday night.The menu is fairly extensive.I let the husband guide us with the selection as he had dined here on a business dinner.He suggested the Satay, Chicken in Pandan leaves as appetizers and some Green Curry with rice which seemed perfect.All though I was hungrily eyeing some soft-shelled crabs on a neighbours table and ask that the Stir fried Crab with fresh peppercorns be added to our repertoire.Our dinner is very enjoyable and we finish it off with some Fried banana fritters served with warm honey and a dollop of vanilla ice-cream.Thai gastronomy indeed! Street carts and food trucks offer a huge variety of mouth-watering Thai delicacies and seem to be a great open air dining option.They serve up some Noodles,Satay sticks,Curry rice and salads.Hand churned tender coconut ice cream too seems to be a great favourite with most tourists here. 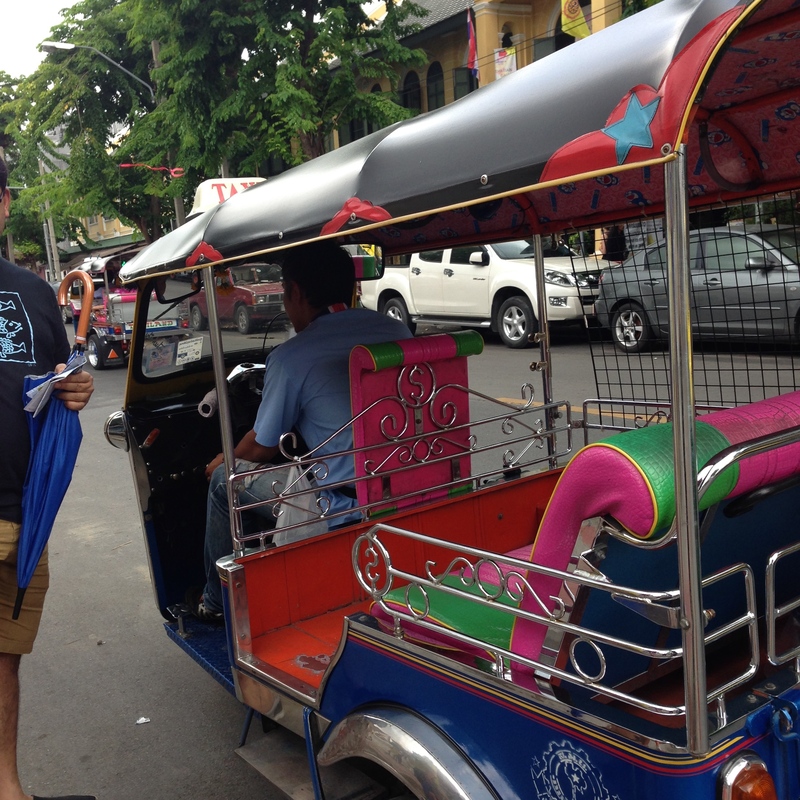 A Tuk Tuk Ride around the city is a fun and inexpensive way of seeing the city. 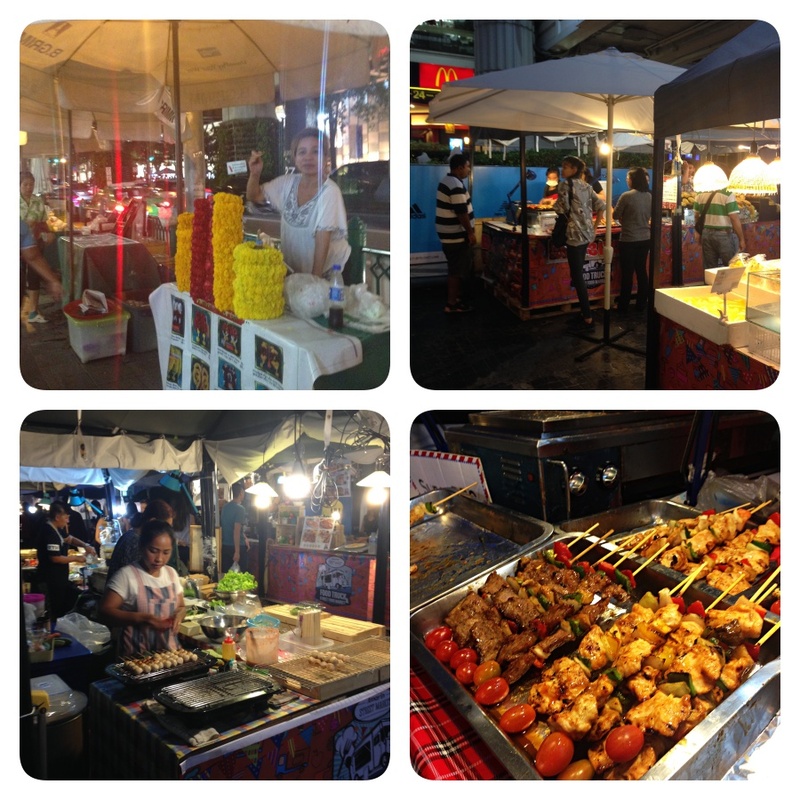 Bangkok is indeed a foodie paradise with a cuisine which combines a multitude of flavours that incorporate a happy balance between spicy and sweet.The list is endless,however I’ve listed a few of my favourites that are a must eat,be it street food, casual or formal dining. Now I do cook some fairly decent Thai meals off and on, as the family does enjoy it. 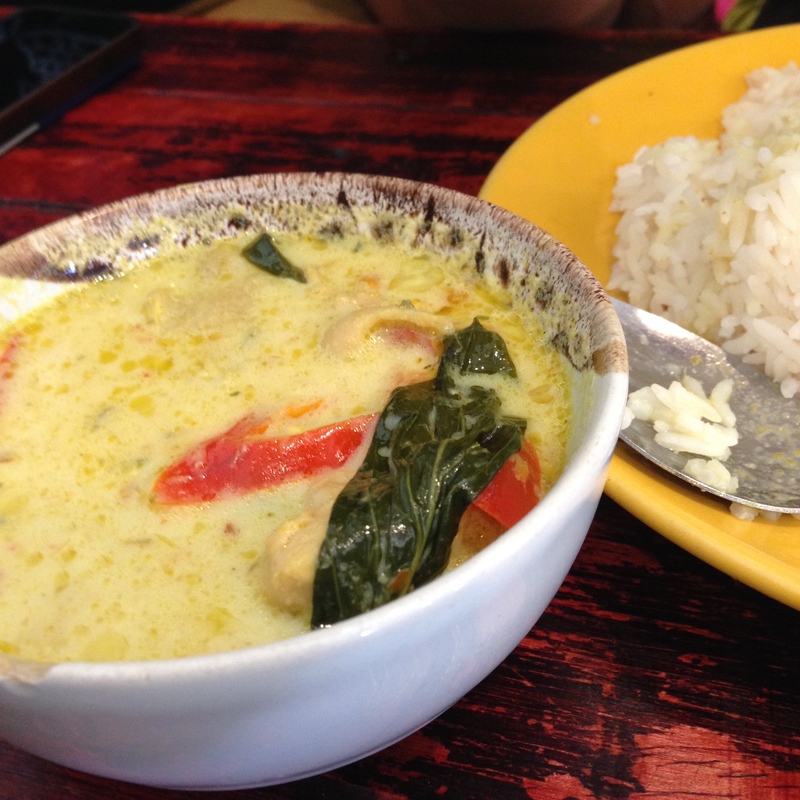 I thought I’d leave you with my favourite recipe for a Thai Green Curry with Chicken.I have used a ready curry paste that is great to keep handy in the pantry.You may choose to use either Chicken,Shrimp or even Beef for the base.The use of some lemon juice and some Thai bird chiles over the curry definitely elevates the flavours in this curry. Slice the chicken into thin fillets and chop into medium pieces. Fry this in a little oil and keep aside. Add a tbsp. of oil in a pan and fry the white parts of the onion. Add the ginger-garlic paste and fry for a couple of minutes. Then add the green curry paste and fry for about 4-5 minutes. Next add the chopped mushroom and green capsicum and sauté till cooked. Now add the baby Aubergines and cook for a while .Add the chicken pieces. 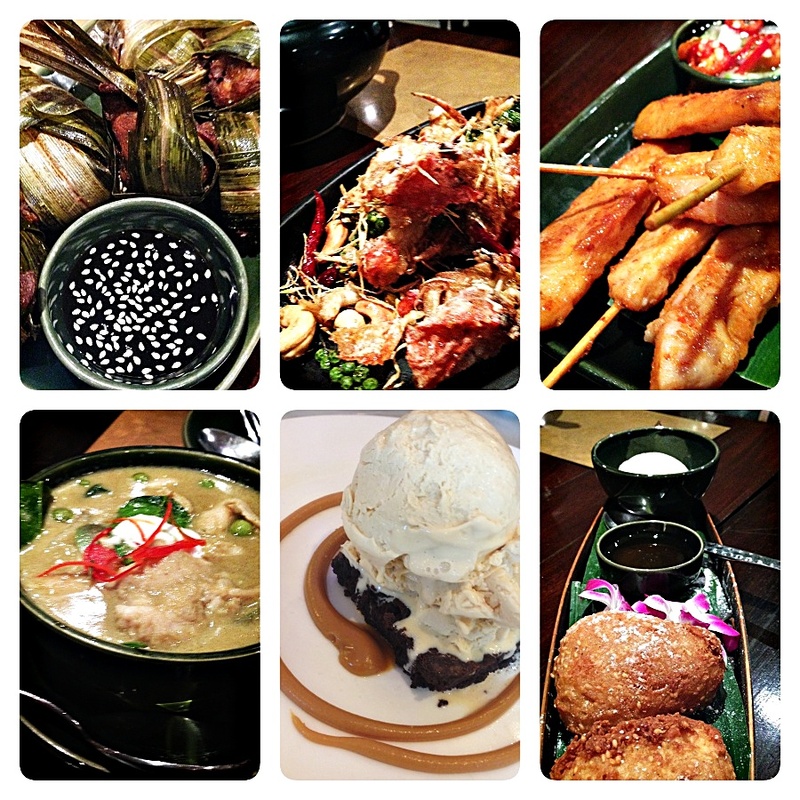 Excellent insight into Thailand’s food, culture and heritage! Thanks Balvinder…yes we all love the food too and the trip was a great one!! 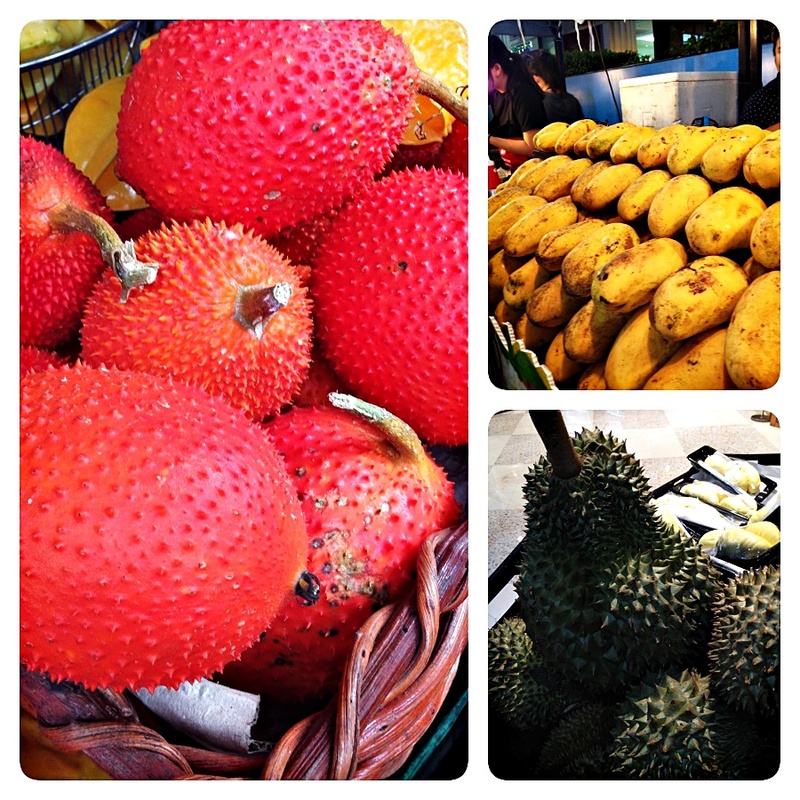 I have visited Bangkok more times than I can count and love the mix of great foods there. I’ve done a few cooking classes in Thailand and I learned that locals usually use 5-8 chills per person while I prefer just 2 chilli for myself. So for a curry to feed 4 people, a Thai person might use 30 whole chilli! 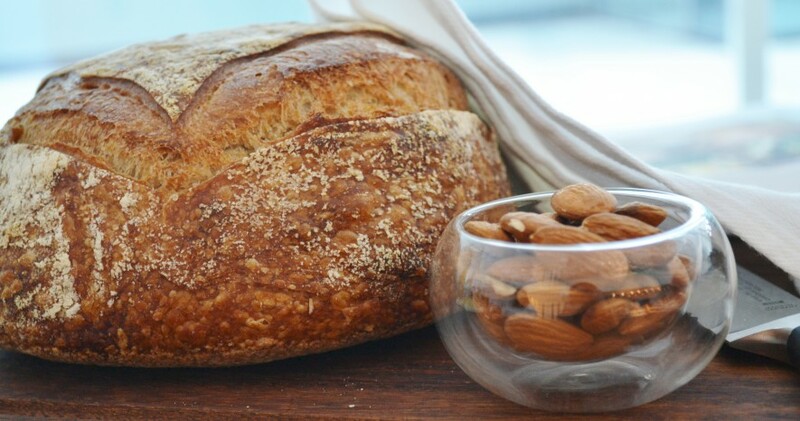 This post would make a great addition to Our Growing Edge, a monthly blog link up just for new food adventures. It’s a fun way to share your new food experiences with other foodies. This month’s theme is TRAVEL which includes any recipe or food experience inspired by travel. 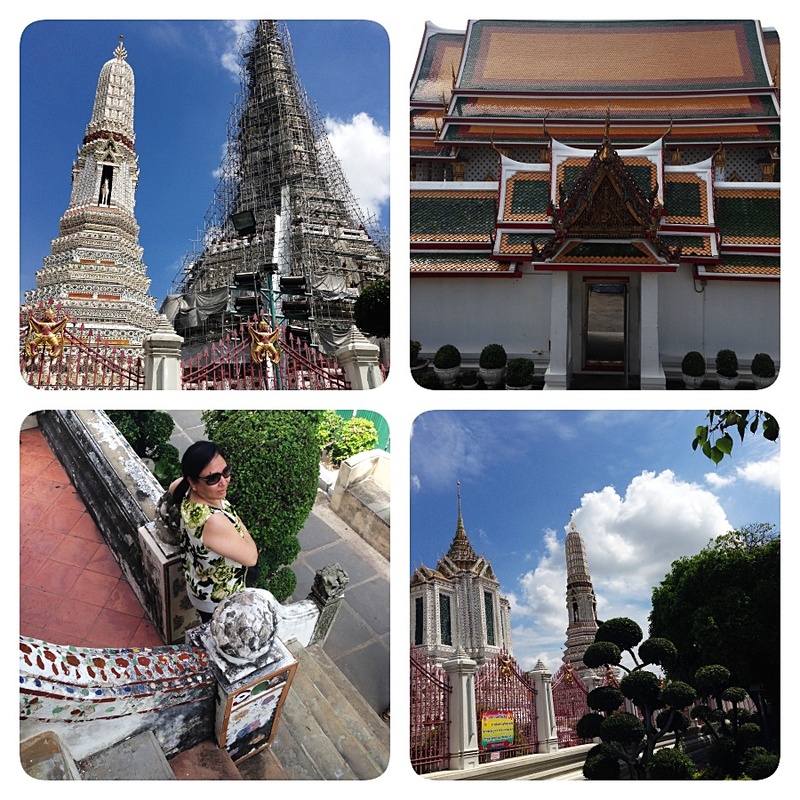 Great pictures – I enjoyed vicariously visiting Bangkok via this post. If only the travel time was “fairly short” for us here on the east coast of the US…I’d travel back to the Far East in a heartbeat. I haven’t been to Thailand in years and would not recognize it except for the temples. Loved your post. What a fun post! Such a beautiful place, beautiful food!! all those colors… We were only in Bangkok briefly on a flight through to India years ago. I’d love to go back– thanks of the peek into your trip! Great post! 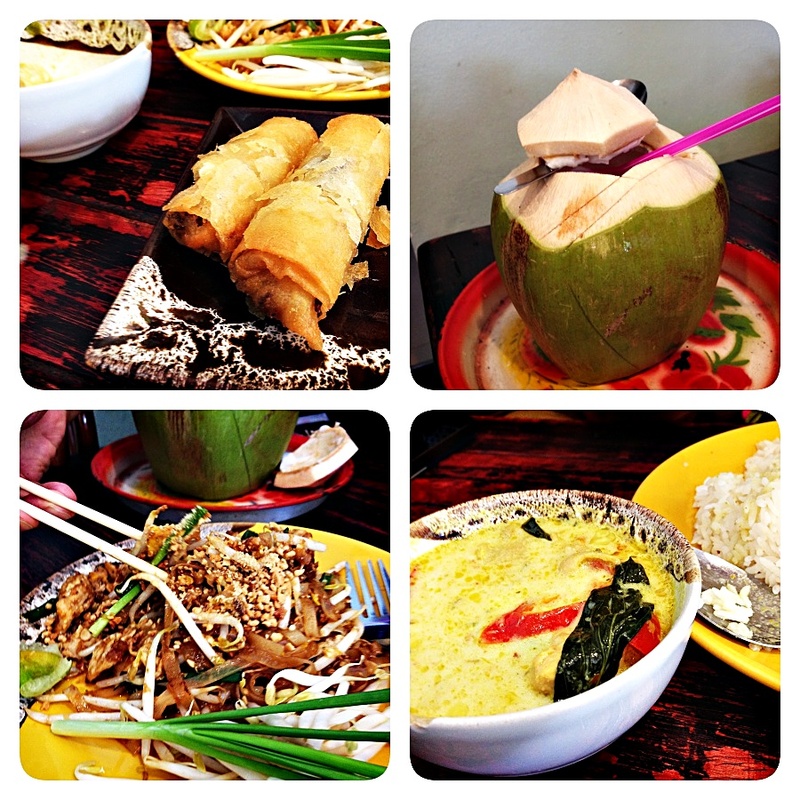 We like Bangkok a lot and we certainly love Thai food! lovely photos and nice info….